Today’s two first readings communicate a feeling of urgency, of transition, of terrible things to come. The Gospel however gives a more hopeful outlook, it resonates with a feeling of ending of one thing and the beginning of something completely new. First we have the prophet Jonah walking across Nineveh announcing that in forty days this great city would be destroyed if they did not mend their ways; then we hear Paul telling the Corinthians not to get too comfortable in their lives because the Lord’s return was at hand. In the gospel however, although we see Jesus, like Jonah proclaiming the message of God and calling the ancient world to repentance there is a bit more to the story. Here we also see how the Lord calls his first apostles and how these men abandon everything they had not because Jesus performed some great miracle, or because they had a tremendous spiritual experience. These men... these hard working men accustomed to back breaking work abandoned everything they have known in their lives to respond to Jesus’ simple promise “If you follow me I will make you fishers of men”. All the anticipation, all the fears in the two previous readings are dissipated by this simple statement from Jesus. Here Jesus is revealed as something completely new in the history of the Jewish people, and we see the transformation of Jesus from just another prophet, into something the people of Israel have never seen, into something completely different. Up until this moment prophets communicated the directives they received from God, and nothing else. They were the voice of God in a sinful and broken world, and were condemned to witness its corruption and slow death; but in today’s Gospel Jesus changes this, not only he preaches about the Kingdom of God, but unlike the prophets of old. He takes what he finds in this kingdom and transforms it into something new, something the whole world has never seen before, something life giving. 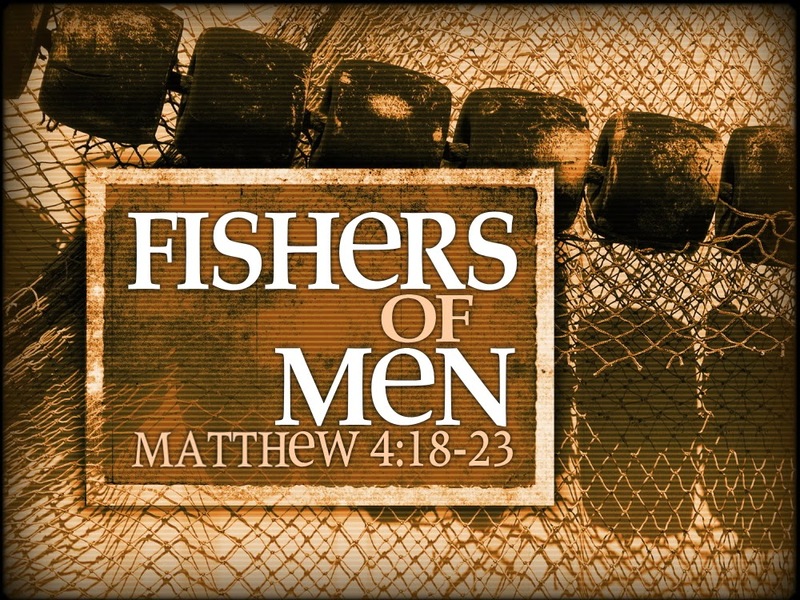 “ I will make you fishers of men”...Think about it for a second, when we go fishing we take fish out of their natural environment, but when we fish a man from the water we are rescuing them, we are taking them from a potentially deadly environment into the safety of our boats. Jesus did not, take something from the kingdom of God and destroy it to form something new, Jesus took what the apostles had in over abundance, the work they knew so well and offered to show them how to use this in a completely new way. To rescue men from their sinful environment and bring them life for Glory to God. There is a part in the mass, which always reminds us of this moment in the history of salvation, of how God can take anything we humans have to offer and transforms it into something that is life giving. Right after the offertory, when the priests lifts the chalice and says: “Blessed are you, Lord God of all creation, for through your goodness we have received this bread and wine we offer you: fruit of the earth and the work of human hands” This wine and the bread which was produced by the work and the suet of humans becomes the body and blood of Christ, something divine, which gives life to the world. In this moment of the mass we connect with that crucial moment in the history of salvation, and at every mass Jesus once again tells us “If you follow me, I will make you dot.dot.dot”. The challenge for us today and at every mass is to ask ourselves how are we going to respond to that invitation from the Lord, how are we going to fill that “ dot,dot,dot”. How are we going to allow him to use the work of our hands, to rescue the world from its sinful and corrupted state. 2000 years ago Jesus took on changing the world with just a few fisherman. Now imagine what he can do with the work of our hands here in Saint Michael. If I were to do an employment survey here today I bet that I would get a fair number of retired people, a lot of students, and a great diversity of professions. Again Imagine what can the Lord do with all the work our human hands. All we have to do is answer to His call and allow ourselves to be challenged like the apostles, following him and letting him bless and consecrate the world by the work of our own hands.